Consort Display Group was the first banner company to design light pole brackets specifically with performance in mind. Prior to this, brackets consisted of steel pipe arms, welded to steel collars, that were then bolted to light poles. The steel would bend in the wind, collars were rarely tight enough on the varying-sized poles, and banding would often loosen during wind storms. 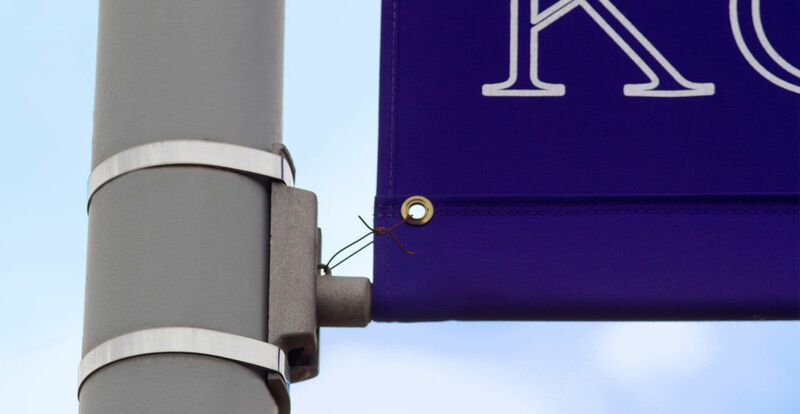 These hardware errors also affected the banners, which would often rip and tear during wind gusts. Moreover, the steel rusted quickly and became an eyesore. Kalamazoo Banner Works discovered a solution to these issues. In the 1980s, KBW introduced a line of fiberglass arms, incorporated a stainless-steel banding that took the exact shape of each light pole’s cross section, and developed and patented the BannerFlex® D3 “adjustable” bracket. The D3 was the first banner bracket created to use flexible fiberglass arms rather than steel rods. The use of fiberglass adds flexibility, while maintaining strength. To insure adequate strength and durability, KBW contracted to undergo the first full-size wind tunnel tests in 1984 at the GM Aeronautical Laboratory in Detroit. Subsequently, KBW has performed 4 other tunnel tests. Three smaller tests were performed at the University of Michigan tunnels in 2001 and the fourth was a comprehensive full-size test at the Jacob-Sverdrup facility in Allen Park, Michigan in 2002. The BannerFlex® D3 banner bracket system also underwent years of extensive research and engineering (35 to be exact!) and quickly became the most trusted and most recommended banner hardware in the industry. Each D3 bracket is comprised of heat-treated aluminum giving each bracket superior strength and durability. The corrosion resistant brackets can be powder coated, in bright Aluminum or Black, and will not rust. The brackets cantilevered castings allow wind energy to be transferred from the banner to the fiberglass arm. This keeps the banner trim and in tension and promotes banner longevity. 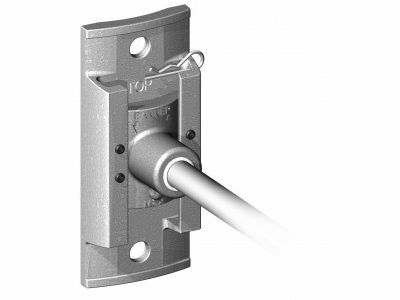 BannerFlex brackets have become more and more popular, and are now an industry standard. Because of this, other manufacturers have attempted to replicate the product. Imitation products often fail and create issues for the consumer, as well as safety hazards. So how can you tell imitation apart from innovation? Pultrued fiberglass adds flexibility, while maintaining strength. 4 Degree cant adds tension to the installation and a well presented banner. Carries the industries longest warranty of 10-years. Bright Aluminum or Black Powder-Coated. Over 35 years of product research. Trust the Innovators, not the Imitators!